Twenty four hours before Halifax’s first team met at the club’s training base at Calderdale College to resume training, the newly-reformed reserve set up also gathered for the first time. The new side will play in the RFL’s revamped reserve grade competition, with 10 teams - five from the Championship, five from Super League - committed to a minimum of 15 games a season over the next three years. 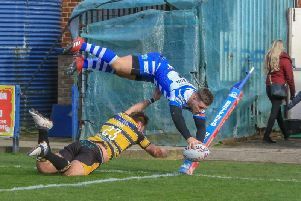 Fax’s former Warrington back rower Simon Grix, who will have coaching input into the side, attended the meeting along with head coach Richard Marshall, although the final coaching structure is yet to be announced. “When I came here, we had a first team and not much else,” said Marshall. “This is an important step for us, partly in terms of keeping senior players who aren’t in the first team match fit and partly providing a pathway for young players into that first team. “I’ve been involved with youth development for Warrington and England and this is what I want to do; we’ve invested in it and we’re committed to it. “In the end, we want the best 17 people and players we can on the field for Halifax, but if some of those are local, so much the better. Players committed to the new set up include the former Warrington and Siddal forward Bob Holroyd and Huddersfield prop Elliott Morris, while Siddal and England amateur Chester Butler will get his first chance as a professional. “I’d be surprised if Morris and Holroyd didn’t force their way into the first team at some stage,” said Marshall.